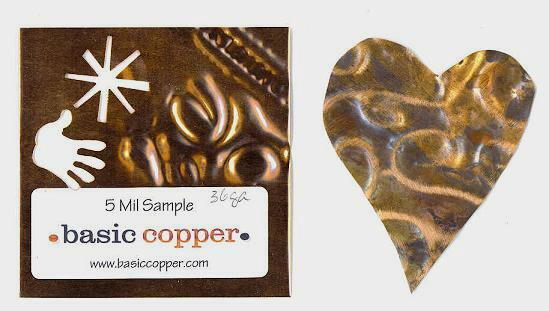 Working with Copper Sheet in Arts & Crafts by Belinda Spiwak of Aurora, Illinois. Working with metals can be confusing. There are a lot of terms that are industry specific. 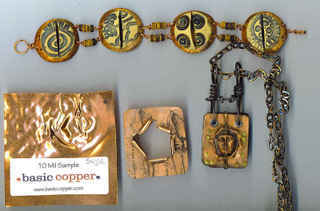 How does a mixed media artist or someone who creates art jewelry going to make sense of it all? Well, I have set out to do a little research to make it easier for you and me to understand. on this website. This will give you answers to many basic questions about what to expect from each thickness of copper sheet. It will also give you examples of projects and crafts that you can create each thickness of copper sheet.
. That is going from thinnest to thickest. I have included a photo of a sample of each of the thicknesses below as well as photos of different projects created with the copper. is slightly thicker than the foil you use in your kitchen. I can think of so many uses for this foil! One of my favorite projects is to combine the copper foil with fabric. It adds an interesting texture and is very easy to work with. copper sheet will not hold its own shape without something behind it to reinforce it. I would not use this for metal embossing. is the next thickest copper sheet. It is still quite pliable but to punch it requires quite a bit of pressure. You can tell from the marks on the sample that I had a hard time trying to get a punch to work with this thickness. (I had to step on it to get the punch to work.) You can still use a pair of scissors to cut it. I would use this weight for art jewelry but would use two layers cold connected together or have something solid in back of it. It is also a good coiling thickness. You could use round nosed pliers and create some great coils or rolled beads with this weight. You could stamp it, paint it, or put some transfers on it first. This thickness would also work in a lightweight capacity in assemblages. You can also use this thickness for dry embossing but your images or designs would have to be more broad as it would be more difficult to get fine detail with this thickness. Puffing out the copper would work well with this thickness. copper definitely needs to be cut with a pair of snips or something similar to cut it. As with any sheet metal, the edges can be extremely sharp. Be careful when cutting or working with it. Whenever I create pieces that have sharp corners, I usually use an old pair of scissors (so I don't worry about ruining them) and trim the corners so that they are slightly rounded. You can use your Dremel, sand paper, or sanding block to sand the edges so that it is not sharp or rough to the touch. It can be a daunting challenge to start to learn a new craft, so the most important thing is to have fun and don't be afraid to experiment. You will certainly be rewarded for your efforts by the countless objects you can create with this beautiful and unique metal.